Barcelona (Catalan: [bəɾsəˈɫonə], Spaingie: [baɾθeˈlona]) is a province o eastern Spain, in the centre o the autonomous commonty o Catalonie. 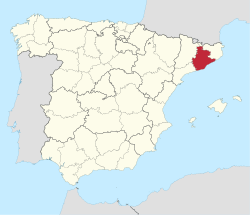 The province is bordered bi the provinces o Tarragona, Lleida, an Girona, an bi the Mediterranean Sea. 5,540,925 fowk stey in the province, o wham aboot 30% (1,621,537) live athin admeenistrative limits o ceety o Barcelona. Its aurie is 7,733 km² an kiver Barcelona metropolitan aurie. The caipital o the province is the ceety o Barcelona, an the provincial cooncil is based in the Casa Serra on the Rambla de Catalunya in that ceety. Some ither ceeties an touns in Barcelona province include L'Hospitalet de Llobregat, Badalona, Cerdanyola del Vallès, Martorell, Mataró, Granollers, Sabadell, Terrassa, Sitges, Igualada, Vic, Manresa, Berga. See the Leet o municipalities in Barcelona an aw.